WOW! This is a great on sewing supplies! You can score a 24 Pack of Polyester Sewing Thread for only $3.99! Set of 24 spools of all purpose polyester sewing thread for domestic sewing machine. High quality spun Polyester Machine Sewing Thread, 100% polyester, Z twist, 200 yards each. These are very useful, beautiful colours for any Sewing project. 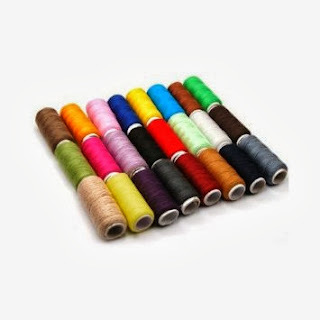 This thread is best for Pillow covers, Garments stitching (coats,baby cloths), bed sheets & linings and other stitching art projects. Use of best quality thread add value and increase the life of your garments. This thread can be used for both hand and machines. The thread is strong and durable, Fast colours. Spool size: 5.7(length)*2.2(diameter)cm approx 183 meters approx each Total 4,392 meters approx.